You can securely and efficiently manage your remote access VPN network from a single point of administration, even as your organization grows and the number of users and/or endpoint devices increases. All necessary activities are performed automatically such as checking compliance with security policies, e.g. Network Access Control (NAC), rollout and manage remote access software and configuration updates as well as licenses and certificates. This way you have full control over your remote access environment saving you time and money. Standardized interfaces allow you to import data from your established directory services (e.g. LDAP, Active Directory) as well as from identity and access management systems (IAM). This allows you to implement a fully automatic identity management system for your remote access users. Read a customer case study example here. A Two Factor Authentication and a full RADIUS Server comes with the standard package of the NCP Secure Enterprise Management. 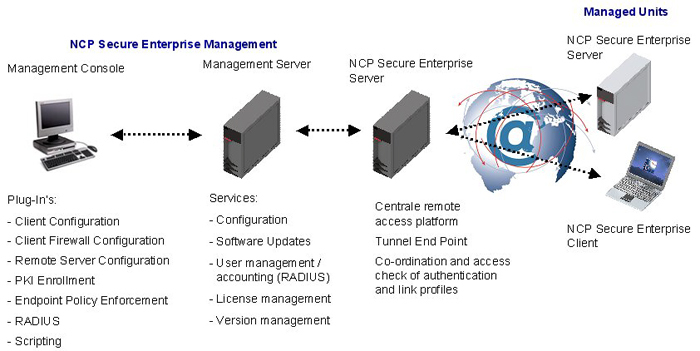 NCP Secure Enterprise Management consists of the Management Server and the Management Console with graphic user interface. 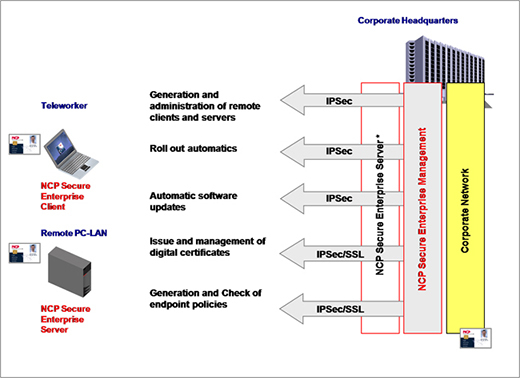 The Management Server serves for configuration and management of all connected NCP components. This includes the NCP Secure Enterprise Clients for Windows, Mac OS, Android, Linux and CE/Windows Mobile as well as the NCP Secure Enterprise VPN Server. The Management Server is a database-based system and it corresponds with virtually any database via ODBC (e.g. Oracle, MySQL, MS SQL, MS Access, MaxDB). Optionally the Backup Management Server ensures high-availability of the Management Server, which always has the current data repository available through an integrated replication service. In all of these cases administrators of legally autonomous companies must have the capability to manage their "shared" VPN. This is done by forming groups and using a convenient method of assigning rights. Administrators are created in such a manner that each has exclusive access to his area, in other words to the units that he is responsi-ble for managing. The possibility of encroaching on data of other clients in their protected areas is excluded. The automatic update process enables the administrator to provision software updates centrally for all remote systems, which will be installed automatically the next time the connected to the VPN. If malfunctions occur during the transmission, then the previously existing software version, as well as the configuration, remain unaffected. The software is only updated after complete error-free transmission of all pre-defined files. All data are transmitted in a highly secure manner, (encrypted in the VPN tunnel). The update can also be done without a VPN connection, as long as the end device is within the corporate network. An integrated RADIUS server is used to store and manage all client link profiles. Optionally the Backup Management Server ensures high-availability of the Management Server, which always has the current data repository available through an integrated replication service. All relevant data can be input or transferred interactively via the NCP Management Console, or it can be input or transferred in script-driven processes; i.e. user data, license keys, provider passwords, can be transferred to the Management Server per remote system (= managed unit), e.g. for a rollout. The NCP Secure Enterprise Server, or a server supplied by any manufacturer (see the compatibility list at www.ncp-e.com) can be implemented as VPN gateway. Secure Enterprise Management can thus be integrated within any existing IT infrastructure and it enables operation even in complex VPN environments. Message in the event that no more licenses are available. This plug-in enables configuration and administration of NCP Secure Enterprise Clients. All relevant parameters are predefined and stored in templates. Individual menu items and configuration values can be set as "not visible" or "not changeable" for the user. 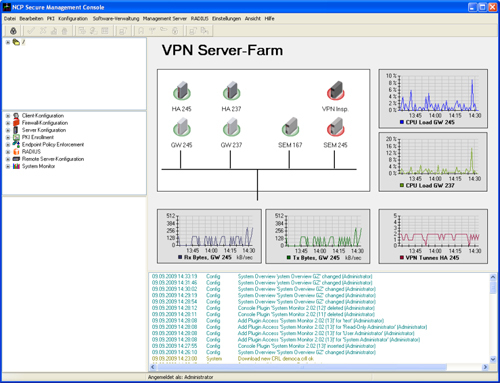 This plug-in provides fast information about all important events within a VPN installation, in the form of bargraphs or line diagrams. The administator can use the system monitor as needed to call up current status information in real time, or to access previously saved data repositories of the remote access environment. Ratio displays of two events is possible. Page forward, page back in the respective period in the displayed diagram Colors and views of the diagrams can be freely selected. 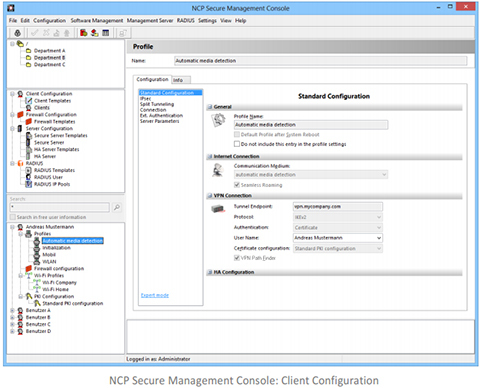 The NCP Secure Client software has an integrated Personal Firewall, which can be managed centrally for the enter-prise versions. The Client Firewall Configuration plug-in enables granular adjustment of firewall rules per teleworkstation. Central specification of the user's possibilities to access the firewall configuration. Use this Plug-in, in order to configure and manage NCP's central Secure Enterprise Server and NCP's Secure Enterprise High Availability Server. If you use a gateway of a third-party supplier and the plug-in, only the features of our non-managed system (web interface) are available to you. This function module is the connecting link between a Public Key Infrastructure (PKI) and the remote access VPN environment. The PKI Enrollment plug-in functions as Registration Authority (RA) and manages the creation as well as the administration of electronic certificates (X.509 v3) in conjunction with different Certification Authorities (CA). Supported CAs: T-Telesec NetPass, Microsoft, NCP Demo CA, others (e.g. RSA Keon) are possible via CMP (Certifi-cate Management Protocol) A generated certificate can optionally be stored as soft certificate (PKCS#12) or on hardware, e.g. smart card or USB token (PKCS#12). The NCP Demo CA that ships with the product can be used to simulate a PKI during the test phase, however it is not intended for productive implementation. Conversion to an external CA is problem-free. Use this plug-in to define all security-relevant parameters that must be checked prior to an access to the corporate network. Compliance with the specified security policies is mandatory and cannot be bypassed or manipulated by the User. Advantage: Existing RADIUS servers can be combined, i.e. they can be replaced in an economical manner. Disconnect or continue in the quarantine zone with instructions for action (Message box) or start of external applications (e.g. virus scanner update), logging in Log files. IF-MAP The overall aim of the ESUKOM Project is the design and development of a real time security solution for company networks which works on the basis of consolidating meta data. 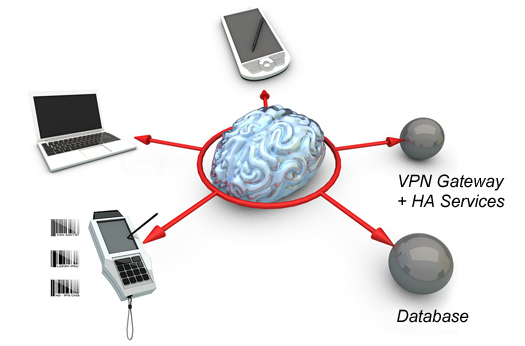 The special focus of the project is the threat resulting from mobile end devices, e.g. smartphones. ESUKOM focuses on the integration of existing security solutions (commercial and open source) which are based on a consistent meta data format according to IF-MAP specifications of the Trusted Computing Group (TCG). Download the NCP Secure Enterprise Management Datasheet (PDF).